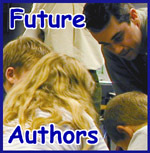 "When I grow up, I want to be an Author and Illustrator like you. Your pictures were really good." "I really liked learning something new." "You taught us a lot about the water cycle in a fun way, and my favorite part was you reading the book, it was so great." "...we had a lot of fun but the best part was making the story and getting to hear your book..."
"I really like how you let us write our own story. It was great fun. I wish you could come again." right by your school next year. Don't miss out! 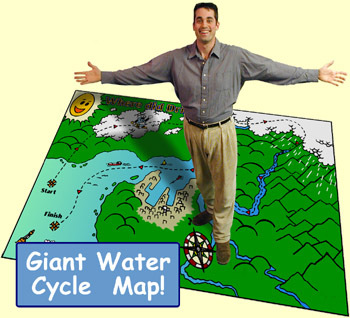 A fun, educational reading of a Drippy adventure, by Mr. Water Cycle himself, using an oversized book so all can see. Drippy the Raindrop appears, in person, and walks the students through his HUGE Water Cycle map. 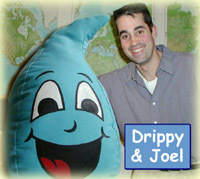 Joel and Drippy help students create their own Water Cycle story. Free signed bookmarks given to all students and staff. Joel will sell signed Drippy items. Finally, the coloring page masters, both signed books, the audio CD, and the "Where did Drippy go?" maps will all be left at your school. the cost is affordable for either a full or half day visit for your school. We are working on Drippy visits for your home country. Please e-mail for more information.